It is a familiar Christmas story in America: a community adopts a symbol of the season — a Nativity, a tree or something similar — then the city gets threatened. Fearing a costly public battle city officials quickly give in. This time it is Knightstown, Indiana and the symbol is a cross atop a city Christmas tree. The ALCU calls that “establishment of a state religion”. According to several media reports Knightstown resident Joseph Tompkins argues that the Christian symbol on display in the Knightstown town square violates the First Amendment. The lawsuit is seeking for removal of the cross, monetary damages and declaration that the cross display violates the First Amendment. Tompkins, and the ACLU, agree that the cross is offensive and “forcing” religion on those who don’t want it. What they want is money and to force EVERYONE in Knightstown to believe as Tompkins believes. In essence, if this case is won by the ACLU Knighstown will be forced to be atheist. Nobody will see it that way, of course. The community has responded as you would expect. Crosses are suddenly everywhere. But this will end as it always ends. The cross comes down. There will be no court case. And yet another sad chapter in misreading the Constitution will be written. The suit says Tompkins “is forced to come into direct and unwelcome contact” with the cross on top of the tree as he drives through town. This, the suit says, has caused him “irreparable harm,” which can only be remedied by taking the cross down and paying Tompkins monetary damages. The only “irreparable harm” comes from an elected City council that won’t stand up for itself and for the people it represents. They should counter sue for damages caused by all the publicity and take it to the ACLU. Hit them where they live — in the pocketbook. In the most famous Christmas light fight in America things are about to get really ugly — if they weren’t ugly enough already. The City of Plantation, Florida has imposed every warning, fine and ordinance it can but the Hyatt Extreme Christmas display has not only endured it has grown larger. So the city is going to court to prove its case. According to local media a judge will hold a hearing on the matter June 4th. The case is important because Christmas lights on a much smaller scale have become an issue in many communities and home owner associations across the country. During 2014 we documented several instances where even simple displays of Christmas were disputed by local ordinance. If the City of Plantation case against Hyatt Extreme Christmas is successful it may fuel further lawsuits against Christmas light lovers. Plantation Mayor Diane Veltri Bendekovic, who celebrates Christmas, said she is concerned for the neighbors who she said are forced to flee their homes during the holiday season. The Hyatts were featured in 2013 on “The Great Christmas Light Fight” for their display that features moving characters, a movie screen showing a loop of films, a snow-blowing machine, flashing lights, and an occasional live Santa and “reindeer.” Judges praised the “amusement-park” quality of their presentation, but the Hyatts lost the $50,000 competition to a family from Decatur, Ga. 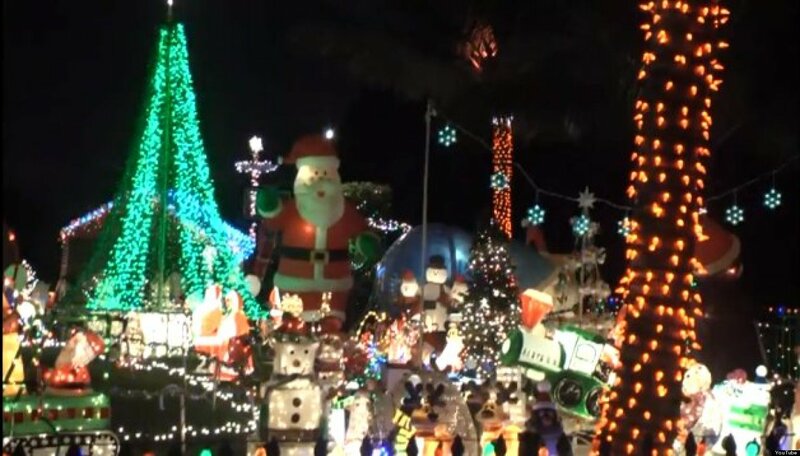 The city filed a lawsuit in Broward Circuit Court in February 2014 to get the display halted. 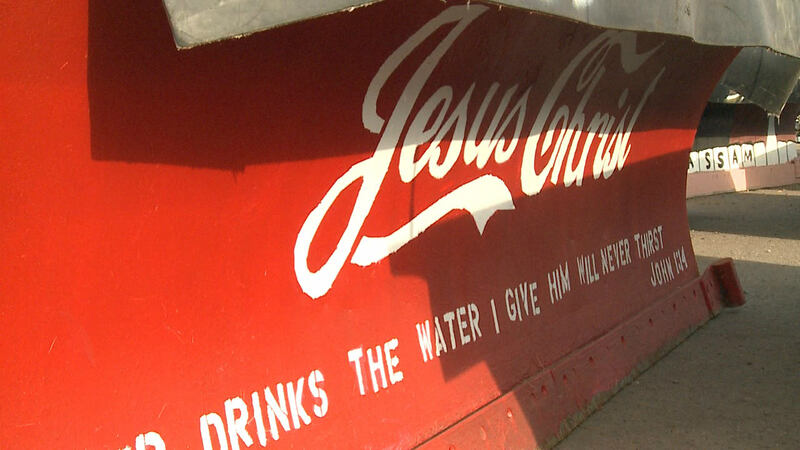 That case was halted due to an injunction filed by the Hyatts last November. That case gets its day in court now and observers predict the Hyatts are going to lose. Bendekovic said she wanted the legal action to continue. The Hyatts don’t speak to the media unless it is to promote their display. They continue to make pleas and accusations on their website and Facebook pages. Some speculate that any lawsuit will be challenged in court and that the display will return this Christmas and for seasons to come as the battle takes place in the courts. Local support for Hyatt Extreme Christmas is difficult to peg. While the display is no doubt wildly popular and draws huge crowds some think most of the monetary and vocal support for the Hyatts come from those who do not live in Plantation and who do not actually have to contend with the issue in their daily lives. For the Hyatts the argument lies simply with their right to do what they want on their own property — an old argument without much teeth in countless cases with municipalities with zoning laws. The first amendment arguments actually make more sense — or would, if the city were demanding that no display be allowed at all. But that clearly is not the case as Plantation has said all along it just wants a Christmas light display that is on the level with other residences in the area. Despite the debate the real costs are running up on all sides. Plantation claims it has spent thousands of dollars for police overtime and traffic control while the Hyatts are working under the burden of imposed daily fines of $250 and other fees in excess of $7000. Now attorney fees for both sides are added to the equation. For the average home Christmas light enthusiast the case is being watched warily. A snide blog post at HoustonPress.com tells the story of Cherokee County in Texas where a Nativity scene — we assume this is a a traditional display there — has come under fire from a local resident who calls the display “unwelcoming toward non-Christians and individuals with no religion”. Daniel Ross, in protesting the display, asked to be able to erect a “Human Lights” display next to the Nativity. representative of Cherokee County as I cannot speak for the court unilaterally. However, I did receive your email requesting to have a “Humanlights” sign erected next to our courthouse decorations and wanted to respond to you from a purely personal point of view. December 23rd is merely a date selected by your organization to make a political statement of your choice not to celebrate traditional Christian beliefs. Perhaps you should consider choosing another time of the year to demonstrate your secular support instead of attempting to infiltrate the Christmas holiday with a singular purpose to destroy and denigrate the beliefs of others. Try to live and let live. Well, you know well where this is headed. Sure enough, American Humanist Association is now crowding in on the act, throwing the weight and the money of a national organization into the fight and sent a letter to Cherokee County asking the whole thing be removed on the age-old flawed argument that nativities somehow violate the establishment clause of the U.S. Constitution. You know where this is headed. We just hope they get this resolved before Festivus. Two snow plows painted by a local school as part of the Sioux Falls annual ‘Paint the Plow’ event might not make it out on the street this winter. One group is challenging the city. City Hall soon will be decorated for the holidays but one group is attempting to fight city hall on just how much government can get into the Christmas spirit. The group Freedom From Religion Foundation or FFRF recognizes several state and local government buildings are decked out for the holidays. It”s why the group has an issue with these city snow plows decorated by a local school. “They’re basically a roving billboard. I think citizens in the community would perceive a problem with it if a plow said ‘praise Allah, or there are no gods.’ That’s city equipment. It’s moving around the city basically all winter,” Elliott said. Now those plow will come with a disclaimer. Even after the Christmas season is over, some may argue religious symbols are part of our daily life, whether it’s on our money or in our Pledge of Allegiance. “We think those things are problematic as well. The courts obviously haven’t agreed on a number of those things and when they’ve addressed those, they’ve more so been allowed because of their history,” Elliott said. The group Freedom From Religion Foundation says it has about 10 other cases it’s working on challenging the separation between church and state as a violation of the Constitution. Every Christmas season we receive dozens of reports of stolen or vandalized public nativity scenes from across America. Rarely is any ever caught or punished for the crimes. News out of Virginia bucks that trend when a man from the town of Forest, Virginia was tried and convicted for stealing and then destroying a nativity scene. While he won’t have felony convictions on his record, Scott Cooley must spend a year in jail for stealing – and subsequently destroying – the Nativity scene at Shiloh United Methodist Church in Forest, a judge ruled. Cooley pleaded guilty Tuesday to one misdemeanor count each of petty larceny and destruction of property. He, along with two other men, initially faced a felony count each of grand larceny and destruction of property worth over $1,000. Assistant Commonwealth’s Attorney Stephanie Ayers asked Circuit Court Judge James Updike to amend the felony counts to misdemeanors at the request of church officials. The church, while wanting to hold Cooley and his cohorts accountable, did not want to push for felony convictions, Ayers said. She characterized Cooley as the ringleader of a group that took the nativity scene, valued at over $2,000, on Dec. 9. They subsequently posted a picture of themselves on Facebook with the set, and later destroyed the figures, which included a baby Jesus, Mary, Joseph and three wise men. Ayers said after reports of the theft surfaced, the group cut the figures into pieces and took them to the Bedford County landfill. 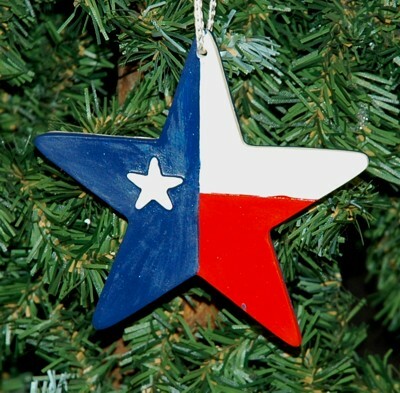 The Texas state senate passed the Merry Christmas Bill and it has now been sent to Governor Rick Perry for his signature. The bill would clarify that schools may have Christmas trees, nativity scenes and other displays as long as any display includes a scene or symbol of more than one religion. â€œThis will provide students, parents, teachers and administrators a safe harbor for openly celebrating a federal holiday without fear of litigation or retribution,â€ said Sen. Robert Nichols, R-Jacksonville. â€œOur school officials and teachers have enough on their plates without having to worry about frivolous lawsuits and retribution for recognizing Christmas or Hanukkah.â€ Nichols said the guidelines for exchange of greetings such as â€œMerry Christmasâ€ and â€œHappy Hanukkah,â€ as well as the display of symbols marking those holidays, are consistent with rulings by the U.S. Supreme Court. Sarah Childs had a beef with her neighbor and wanted the whole world to know about it. 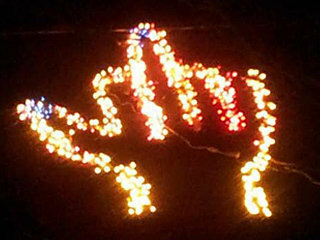 So on her property in Denham Springs, Louisiana she put up a Christmas lights display that was sure to get everyone’s attention: her lights prominently showcased the image of a human hand with the middle finger extended. When the local police department threatened her the whole thing ended up in court. That case was settled with the ACLU winning $15,000 for attorney’s fees and an agreement that Childs can continue to “flip the bird” at her neighbors. The display got plenty of attention when it first went up in November 2012. Neighbors called police to complain and Denham Springs Police Corporal Shawn Perkins paid her a visit. Corporal Perkins told WWL Radio the homeowner told him she put the display as a direct message to her neighbors. “It was a message to an ongoing dispute she was having with other homeowners on that same street,” Perkins said. Perkins says he informed Henderson that the display was in violation of obscenity laws and that it must come down, or else. She agreed that it wasn’t worth the possible hassle of fines and legal action,” Perkins said. With victory at hand Childs has given no indication of whether or not she will repeat the display. 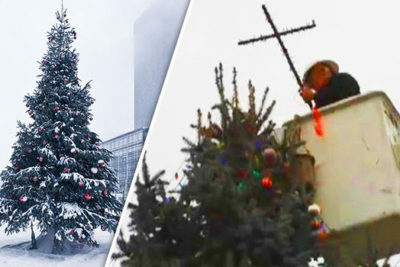 Mayor Jim Fouts and the City of Warren, Michigan won a battle in the U.S. Sixth District Court in a fight against the Freedom from Religion Foundation which insisted that the city’s failure to allow an anti-Christian sign in the city’s Christmas display constituted discrimination and was a violation of their free speech rights. 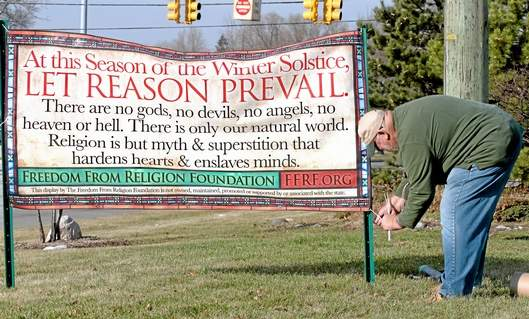 As reported by Defend Christmas back in 2011 the FFRF wanted to post a sign that read “At this season of the Winter Solstice, let reason prevail. There are no gods, no devils, no angels, no heaven or hell. There is only our natural world. Religion is but myth and superstition that hardens hearts and enslaves minds.”, similar to other signs the FFRF has posted in communities all across America. Mayor Fouts refused their request and the FFRF sued in court claiming discrimination and censorship. 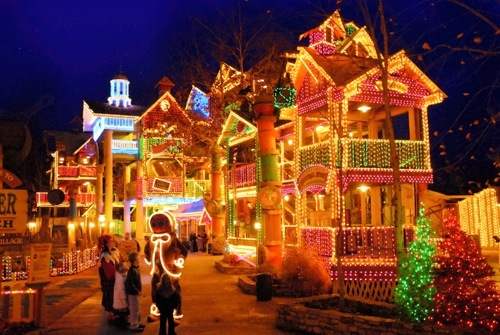 The court agree with Fouts and the City of Warren concluding the U.S. Constitution â€œdoes not convert these displays into a seasonal public forum, requiring governments to add all comers to the mix and creating a poison pill for even the most secular displays in the process.â€ The court also upheld the constitutionality of Warrenâ€™s annual Christmas display, noting it features both secular and religious symbols alike. â€œSuch holiday displays are quintessentially government speech,â€ the panel wrote in a 3-0 vote, also stressing that itâ€™s not illegal if an opposing view is kept out of a holiday display. The court case against the FFRF is an important victory for municipalities threatened by lawsuits by the FFRF. Often, intimidated by the expense and threat of lawsuits, cities cave to the requests of the FFRF and the resulting publicity each holiday season embarrasses cities as they inevitably become the focus of national media attention, potentially affecting tourism, commerce and public relations efforts. Most localities just want to honor time-tested traditions without the fuss of court fights. The issue of Christmas lights is not a new one to us. From cities who have to abandon public displays of lights because of budget concerns to neighbors complaining about over-the-top displays the issue is not a new one. But as technology advances you have to question when it all becomes a little too much. Christmas lights are STILL in the news even though Christmas has past. The first of media reports of people keeping their Christmas lights up too long has already been posted online where discussions of the difference between a “law” and an “ordinance” seems to subdue the fact that Christmas lights to some belong up and on only in December. This report comes from Maine. Henderson County Texas was one of the hotspots in the War on Christmas last year and it appears to be looking to make headlines again. 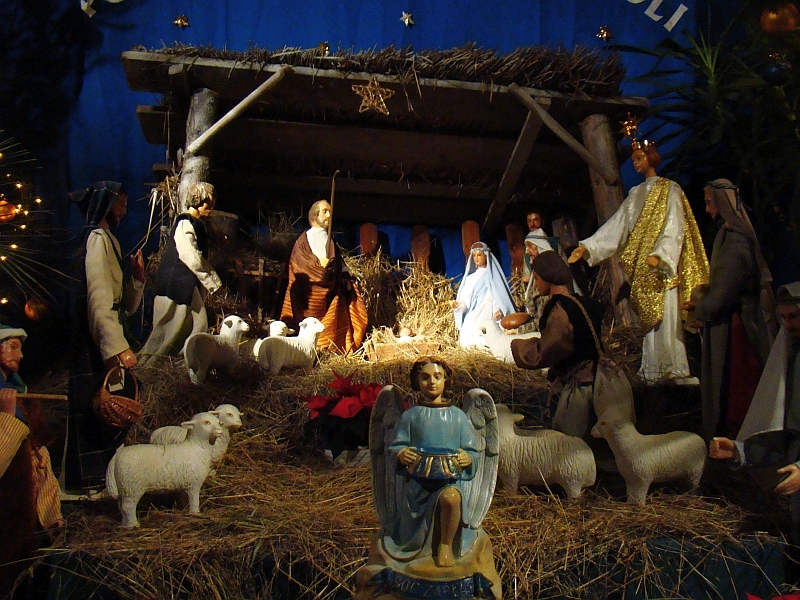 Last year an out-of-state group filed a protest with the county over a nativity scene on public grounds. The group was given a Texas-style welcome for their interference in what most consider a local matter that just happened to get national media coverage. But as Thanksgiving gives way to Christmas later this week all the same parties are back on the same page and Henderson County Texas is about to make news again. Local atheist-turned-Christian-turned-atheist-again activist Patrick Greene is taking a different approach to the situation this year. Last year, when local Christian groups heard of a family health issue for the Greenes they collected money to help. The gesture so touched Greene that he briefly converted to Christianity before returning to his atheist beliefs. Greene was gracious in receiving the gift. But his feelings about the public Christmas displays in Athens, Texas require him to take a stand and he is trying to do so without the heavy handed tactics employed by the Freedom From Religion Foundation last year. “I went to Walmart, bought a cardboard box, got some gift wrapping material and made up a sign that said, ‘This star is a gift from two Texas atheists, Merry Christmas,'” he said. Greene is an atheist from San Antonio. He threatened to sue Henderson County last winter over the nativity scene on its courthouse lawn, which has been displayed each Christmas for more than a decade. But Greene backed off the suit when his health began to fail. As a sign of Christian goodwill, a church in Athens raised money, and sent Greene hundreds of dollars to help him and his wife through the health scare. Greene said they were genuinely touched by the people’s “generosity and kindness,” so they bought a star for the county’s nativity scene. He sent the star in March. “We were very appreciative,” he said. Greene said his sign, which arrived at the office of the Keep Athens Beautiful president on Nov. 20, is meant to undo damage done by other atheists. Henderson County refused both requests. Greene called the Freedom From Religion Foundation’s sign insulting. So that’s when he went to Walmart, made his sign, and sent it, with his demand the sign be presented next to the star. “We can’t risk any more animosity toward atheists by letting people think Christians are the ones that put the nativity scene there, and that Christians were the ones that put the star there,” he said. Henderson County Attorney Clint Davis said once the county officially reviews Greene’s request, the county judge will have the final say on what to do with the sign. If the sign and star are not displayed, Greene said he is drawing up a lawsuit that he will likely file against Henderson County this week or next week, claiming the entire Christmas display violates Texas Constitution because it infers the county is endorsing a religion. “If people are insulted by my sign that said ‘atheist,’ then they have no intention of fostering the Christmas message, because goodwill toward men goes both ways,” Greene said. Davis disputes Greene’s claims that the nativity scene violates Texas constitution. Keep Athens Beautiful Executive Director Carol Morton said despite the distractions, the nativity scene will begin to be installed next week and the Light Up Athens Committee of Keep Athens Beautiful officially kicks off the Christmas season December 1. “We’re here to make a beautiful display on the square for all the wonderful people in Henderson County and the city of Athens, so just come and have fun with us,” Morton said. The atheist movement has won in Santa Monica, California — offsetting a recent defeat suffered in Texas. As we have covered here over the past two years about the Christmas controversies in Santa Monica the fight there came as a result of a beleaguered City Council who just could not make anyone happy. When atheists sued to be part of the 60-year traditional Christmas display that included nativities, Santas, reindeer, and candy canes the City Council opted to initiate a lottery system to dole out display space. When atheists won 18 of 21 spots, Christian display advocates took the matter to court to dispute the process. Today the judge decided against the pro-Christian group, effectively ending the fight and taking Christmas down forever in Santa Monica (except on private property). Leesburg, Virginia was in the news a lot last Christmas because they just couldn’t control how people would decorate for Christmas in the town’s public places. They do not want a repeat of last year’s media fiasco and community uproar. The Loudon County Council is proposing this year to take matters into their own hands. Instead of allowing the public to put up their own decoration on the court house lawn, local media reports say the county is now considering putting up a Christmas tree, Nativity scene, Santa, and a Menorah on the lawn. You can see already where this is headed. That courthouse lawn will not be the only place where folks will be talking this Christmas. The mere mention of a Nativity scene will set out-of-state groups such as the Freedom from Religion Foundation on their heels and will bring out the lawyers. Stay tuned, Leesburg will likely stay in the Christmas headlines. Luzerne County commissioners donâ€™t want another holiday season controversy over the Nativity scene and menorah on the courthouse lawn, so they plan to pass a resolution making it clear that they plan to set up a â€œseasonal holiday displayâ€ this year. Commissioners had removed the Nativity and menorah from the lawn last December after a litigation threat from the American Civil Liberties Union and Americans United for Separation of Church and State. The organizations argued the display violated the constitutional separation of church and state. 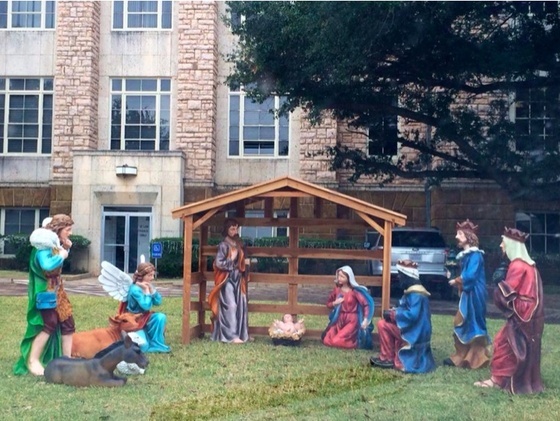 After public uproar, including protesters carrying nativity statues at the site where the display was removed, county officials came up with a more diverse seasonal display. 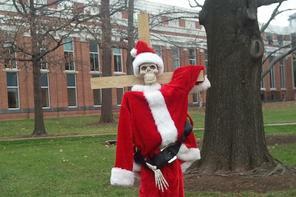 The Loudoun County Board of Supervisors voted Wednesday to uphold a policy that allows unattended displays, including religious ones, to be placed on the public grounds of the county courthouse in downtown Leesburg — effectively ending the first battle in the War on Christmas 2010. In an 8 to 1 vote the board put an end to a heated debate that began in November 2009, when a resident-led commission decided that the county should ban unattended displays outside the courthouse. That decision, prompted by a rising number of requests to use the space, drew the ire of residents when the commission denied a rotary group’s application to place a Christmas tree on court grounds. The appeals of those who addressed the board ranged from impassioned pleas to respect the Constitution to angry claims of religious persecution. Virginia Attorney General Ken Cuccinelli II (R) also weighed in on the matter in an opinion dated Aug. 20, saying that local governments should not be compelled to ban holiday displays that include religious symbols. The opinion was a response to a request from Marshall, who asked whether Loudoun is required to prohibit holiday displays on public property. But the remaining supervisors were ultimately united in their desire to maintain the current policy in the hope that the use of the property will reflect a spirit of inclusion and tolerance. “People who preach the First Amendment need to abide by the First Amendment,” said Supervisor James Burton (I-Blue Ridge), who added that he would be willing to revisit the matter next year if an incident such as the one that occurred last year — when an unpopular display was stolen — is repeated this holiday season. Supervisor Andrea McGimsey (D-Potomac) said she thinks the courthouse grounds should be “a vibrant place” where the community can express itself. “I hope we can put this issue to rest, finally,” she said. A federal appeals court has ruled that two Plano elementary school principals can be held personally liable in a lawsuit over a student’s distribution of religious Christmas candy canes. Principals Lynn Swanson and Jackie Bomchill wanted to be dismissed from the suit, claiming qualified immunity, but a lower court denied their request. The 5th U.S. Circuit Court of Appeals in New Orleans affirmed that ruling on Thursday. The principal’s attorney, Tom Brandt, says his clients will appeal. He says the principals didn’t practice religious-viewpoint discrimination against any students as is alleged. Four families with students in Plano schools sued, alleging their children had been banned from handing out pencils saying “Jesus is the reason for the season,” candy canes with cards describing their Christian origin, and other religious materials.